With contemporary water feature designs available from a range of nurseries and online suppliers Tasmanians have access to original water features for the courtyard, patio of garden. Local nurseries and garden centres are a great place to start, and sculptors such as Folko Kooper at Mangalore are well worth a visit. 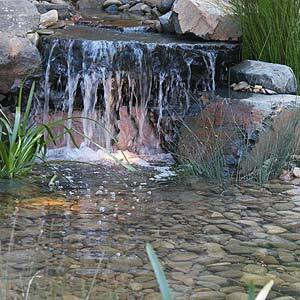 For a custom made stone water feature you could try PV Stoneworks at Lanena. Other local artists also do custom work. Landscapers such as Graham Green in the North West can create great water gardens, so when you think Water Features Hobart, local is possible. Suppliers from interstate fill the void, with many being prepared to ship to Tasmania. I you were looking for a classical fountain then the Princes Square Fountain in Launceston would be it, and perhaps something older, but unique would be the fountain, front of Penitentiary at Port Arthur. The innovative water feature in the Royal Botanical Gardens, Hobart is like a series of rills. The railway roundabout memorial fountain was not working last time we visited, however it really is an interesting piece.